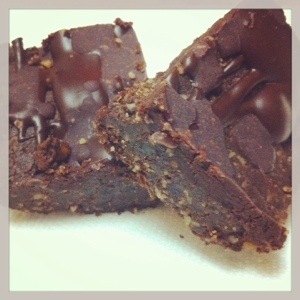 Vegan Potluck and Raw Vegan Superfood Brownie Recipe! Also, vegans usually know how to rock a kitchen and there was no disappointment in the offerings- even considering that Dan and I don’t eat wheat! So much gluten- free vegan goodness. My friend Nancy even made gf vegan crab cakes and remoulade sauce! We brought a Spanish Omelette and Raw Superfood Brownies. It is a real basic raw brownie recipe, but I pimped it out and wanted to share!! In food processor, process walnuts until just crumbly. Add everything else except dates and coconut oil and pulse until combined. Add dates and process until the dates are fully broken down and homogenized with the mixture. Add coconut oil and pulse a final time. Press mixture into pan and leave in fridge to set while you prepare the ganache. Blend in high speed blender until smooth and drizzle or spread over brownies. Let set in fridge. I happened to have some of my raw Chicha chocolates left over from an order, so I melted those and drizzled that on, too! Yum, total decadence!! Well, I survived my yoga retreat weekend thankfully although I was exhausted at the end of it. I am noticing that I sleep more and that I really have to conserve my energy much more than before. For example, if I decide to sweep the floor AND make a meal, then I will surely need a nap after that, LOL. For some serendipitous reason, my body has been craving much more raw food. During the yoga retreat, we ate a mostly macrobiotic vegetarian diet with LOTS of bread! The portions tended to be quite small, and even though I knew it wasn’t optimal for me, I partook in the bread and felt awful for it. I guess my body is just crying out for some light detox and fresh foods. I am not going to complain, I am really enjoying it! To me, summer means fruit! Just look at all this bounty! All organic, as well, from the Maharishi Vedic Agriculture farm here in Spain! So delicious!! Not pictured is another watermelon which I promptly ate half of and juiced the other half, a kilo of figs that had to go in the freezer immediately and about a kilo more of peaches which were really soft. 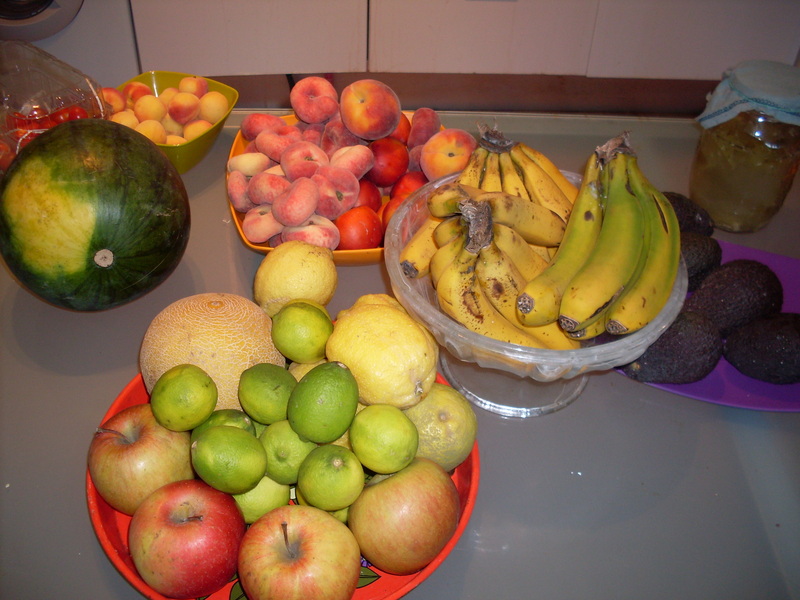 Fuji apples, limes, lemons, cantaloupe, watermelon, cherry tomatoes, apricots, nectarines, peaches, paraguayos (donut peaches), bananas and avocados. I want to share my breakfast yesterday. I had a similar thing today, as I loved it so much! Now, the idea of buckwheat porridge isn’t new to me, but I have always been partial to oats. At the moment, oats really wreak havoc on my blood sugar (again, the joys of pregnancy!!) so I decided to give it a go. Place everything in a food processor and process until smooth. 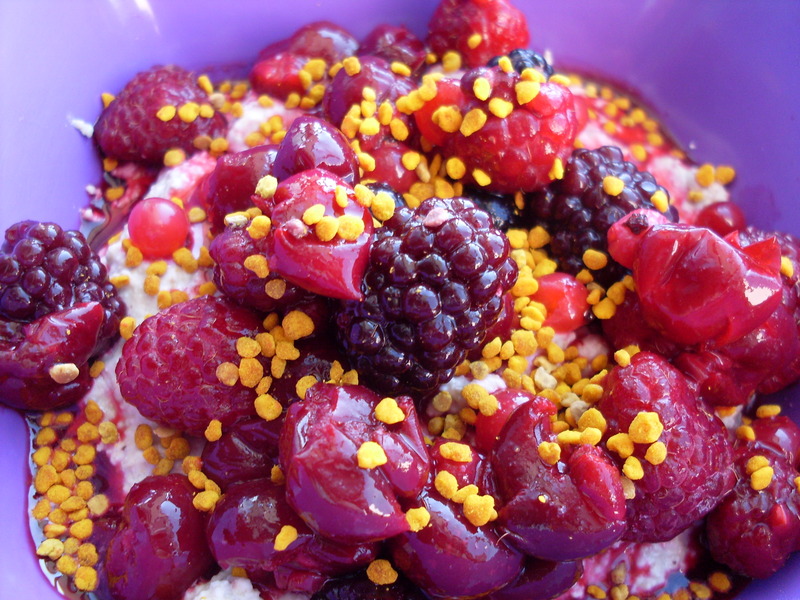 Top with thawed frozen berries and bee pollen. (Today, I used sliced banana and chopped peaches and that was delicious too! 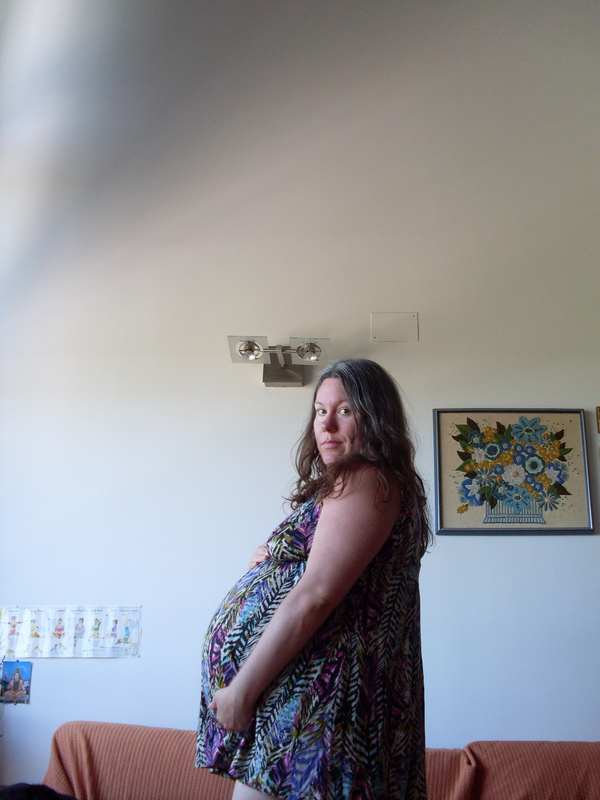 I’ll leave you with a picture of my ginormous belly while I go sip on some more Green Chai Yogi Tea. Yum!